To begin with, Grasshopper is a private branch exchange (PBX) system, which is an internal phone network that an organization uses. Overall, it’s a dependable system, one that’s easy to set up. Plus, learning how to work with the Grasshopper interface takes little time and effort. Grasshopper is an American cloud-based service that was once known as GotVmail. It gives its customers business telephone numbers and extensions to use with Skype or their cell phones. It also includes an automated attendant to transfer calls as necessary. What you’ll get, then, is a virtual phone system for your company rather than an old-fashioned phone system with handsets and wires. Today, Grasshopper boasts more than 150,000 users. People who own small companies or operate businesses out of their homes would probably derive the most benefit from this service, particularly those who don’t make or receive too many calls each day. If you like using your smartphone or Skype to make professional calls ? and you want to let your employees do the same ? then Grasshopper might be right for you. There’s also a Grasshopper mobile application for iOS that will let you perform a few functions, including checking your voicemail. Especially appealing is that you can use this app to make business calls, and the people you reach will see a professional identification. Thus, even if you’re calling from your personal cell phone, no one will realize it. They’ll probably assume that you’re hard at work at the office. With Grasshopper, you can select one of four plans. Pay As You Grow provides you with no free monthly minutes; instead, you must pay 6 cents for each minute on the phone. This concept might be ideal if you’ll make relatively few calls via Grasshopper. However, some people might feel that the rate of 6 cents per minute is a little steep. Meanwhile, the Ramp plan will give you 500 minutes per month. The Grow plan comes with 2,000 monthly minutes, and the Max plan supplies 10,000 minutes each month. With any of these three programs, you’ll be charged 6 cents for every minute that you exceed your monthly allotment. Also, the Pay As You Grow and Ramp plans will issue you a professional telephone number. The Grow program will give you two of them, and the Max plan offers three. When you sign up for Grasshopper, though, you can keep the business phone number that you already have. The cost of doing so is $30, and you’ll only have to pay that fee once. $12 for Pay As You Grow. Naturally, these figures are subject to change, and they don’t include any surcharges, fees, or taxes that may apply. On top of that, after you become a Grasshopper customer, you’ll need to keep paying for your Skype or mobile phone service. If you’re making international calls, you’ll be charged for each minute that you’re on the phone, no matter which plan you have. Those rates vary according to the locations you call; they could be as low as 2 cents per minute, or they might be more than 50 times that amount. Even so, you should find that Grasshopper’s international rates are highly competitive. Other than your internet-connected smartphone or computer, you don’t need any special pieces of equipment to get started with Grasshopper. This lack of hardware will probably come as a relief; after all, maintaining phone equipment can really be a hassle sometimes. When you’re ready to use Grasshopper for the first time, you’ll just log in to your account and follow the simple, straightforward set of directions. In fact, you might be able to complete the entire setup process in 20 to 30 minutes. This process includes customizing your extensions, choosing the extra features that you want to utilize, and recording the message that people will hear whenever you don’t answer. To record this greeting, you can speak into a microphone that’s connected to your computer, or you can use your cell phone. Another option is to create an audio file and then upload it. If you’d like, you can opt for a professional recording in lieu of your own voice. First, you’d type the message that you want to hear. Next, you’d submit it to Grasshopper, and they’d have a voiceover artist recite it. The cost of this service is $75. When you’re setting up your account, you can easily give each of your staff members and divisions their own extension numbers. Grasshopper lets you assign one-digit numbers to departments and three-digit numbers to individuals. At this point, you can take care of your call forwarding as well. Likewise, you can create a directory so that people will be able to find your employees’ names. And it’s a breeze to set up your menu, which will tell callers which buttons to press to reach which departments. You can attach several forwarding numbers to each of your extensions. Those numbers might be your employees’ home phone numbers, or they could be the numbers of other cell phones that they use. Also, you can choose one of two forwarding systems: call queuing or simultaneous ringing. With call queuing, the forwarding numbers will ring one at a time in the order that you select. It makes sense to try to sequence them from the most likely to be answered to the least likely. With the simultaneous option, all of the forwarding numbers that are associated with a certain extension will ring at the same instant, a method that will probably mean less waiting for your callers. You can arrange it so that certain employees will receive forwarded calls at different numbers depending on the time of day and day of the week. For example, you might choose to receive your own forwarded calls at home on weekdays and at a special mobile number on weekends. 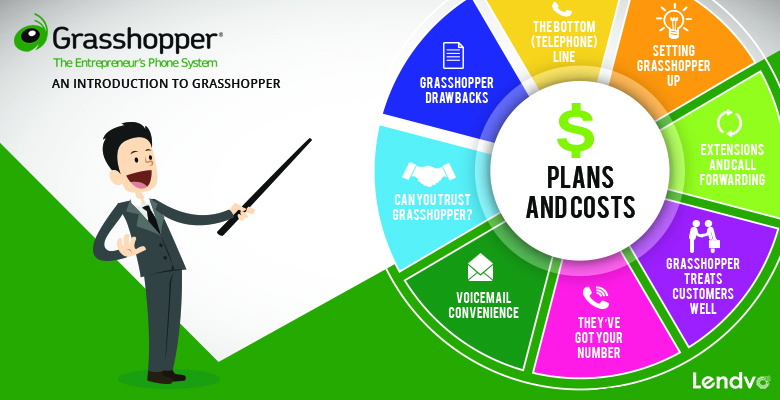 When you become a Grasshopper user, you won’t need to sign a long-term contract; you can simply pay as you go. That fact might set your mind at ease if you’re unsure as to whether or not your company could use a PBX system. This service is flexible. All of these plans allow you to increase your total number of minutes if you find that you need to. Just as important, whichever plan you select, you can have as many extensions as you desire. In addition, the Grow plan and the Max plan let you acquire new lines for incoming calls for free. Plus, you can handle your conference calling through Grasshopper, and you can have music playing while people are waiting for someone to answer. There’s no fee to install or cancel Grasshopper. Also, although you can’t get a free trial period, if you deactivate your Grasshopper system within 30 days, you will get your money back. Further, should you run into any difficulties, you can contact a member of the company’s helpful customer support team. You can reach one of those professionals at any time of the day and on any day of the year. If you’d prefer, Grasshopper maintains a series of user guides as well as a database with answers to common technical questions. You can always search those sources of information to see if they have a solution to your problem. You can get a toll-free business number from Grasshopper, which may encourage more customers and potential customers to call you. Prefixes for those numbers include 800, 844, 855, 866, 877, and 888. Just be aware that there’s a limited quantity of 800 numbers available. In case you’re wondering, 844 is the newest addition to the lineup of toll-free prefixes. It debuted in 2013. What’s more, Grasshopper can set your business up with its very own vanity number. A vanity number is a phone number that people dial by spelling out a certain word. Most of the digits on a phone pad, of course, have corresponding letters. Vanity numbers often impress consumers. Even better, it’s a snap to remember them. Thus, if you have one, it’s likely that more people will call your company. You have a few options every time you get a Grasshopper voicemail message. You can listen to it. You can download it. You can send it to your email address in the form of a rough transcript, one that’s generated by a speech-to-text program. If you’re signed up for the Grasshopper human transcription service, which costs $10 per month, you can get precise text versions of your voicemail messages. When you get a message, you click a certain button, and people who work for Grasshopper will play the recording, type the words out, and give you the transcript. Obviously, the human form will be much more accurate than the computer’s account. Are you someone who’s always forgetting to check your voicemail? For many people, it’s all too easy to miss an important notice. But if you want, Grasshopper will send you a text message alert every time you get a message. Even more helpful, the system can email all of your voicemail messages to you as attachments. With Grasshopper, you can stop your call forwarding by clicking a button, and you can resume it by clicking another button. That way, whenever you wish to relax for a while, you can turn off your forwarding function and try to forget about work. Grasshopper also lets you see what numbers people are calling from so that you can reject particular calls or send callers to your voicemail. Grasshopper is a reliable service. Sure, there may be the occasional outage, dropped call, or other glitch. Such events, which can occur with any phone provider, are certainly frustrating. But on the whole, you can expect that your calls will be clear and uninterrupted. If you’ve been studying Grasshopper reviews on the internet, you may have heard that it didn’t function at all on June 8 and 9, 2011. While this episode might have damaged Grasshopper’s reputation in the short term, the company never again experienced an outage of that magnitude. Obviously, no technology system is perfect, and Grasshopper does have a few minor disadvantages. For starters, it doesn’t offer call recording or video calls. Most PBX systems provide outbound internet faxing, which means that you can fax materials to others virtually; no actual fax machine is necessary. Grasshopper, however, doesn’t offer this feature. It does let you receive incoming faxes, though. With Grasshopper, the cost of transferring phone numbers, both local and toll-free, is somewhat higher than average. The company’s conference calling can be expensive too. That’s because you must multiply the number of minutes that a conference call lasts by the number of callers to find out how many minutes you’ll be billed for. For example, imagine that you conducted such a call with five people, and it was 10 minutes long. You’d get charged for 50 minutes. Therefore, if your business relies heavily on conference calling, Grasshopper might not be the most cost-effective provider for you. In the final analysis, Grasshopper is comparatively inexpensive. Better still, it offers an array of useful features so that you can make and take business calls, send text messages to clients, receive faxes, organize your voicemail, and more. You don’t need to buy or store any apparatuses to accomplish these tasks. All the same, your calling system ? with its extensions, hold music, and so on ? should impress your customers as being completely professional. If you’re looking for an uncomplicated phone system for your business, one that you’ll be able to set up quickly and use remotely, Grasshopper could be the right choice. Yes, there are many reasons why online Grasshopper reviews are so often glowing.